Dior St. Hillaire eats, sleeps and breathes the Bronx. Like hip-hop itself, she was born in the Bronx. She was raised in the Bronx. She first learned about the intricacies of composting in the Bronx, at the New York Botanical Garden, where she earned a Master Composter Certificate from the city. Now, she and her co-founders of GreenFeen worker cooperative hope to be part sustainability educators, part commercial waste haulers, part biogas producers and part commercial composters. They recently finished a co-op program that’s helping them work toward those goals. GreenFeen describes itself as a social enterprise and environmental consulting firm that uses hip-hop to promote sustainability. St. Hillaire writes and performs rhymes about composting and sustainability. Every GreenFeen worker-owner has at least a few rhymes of their own. 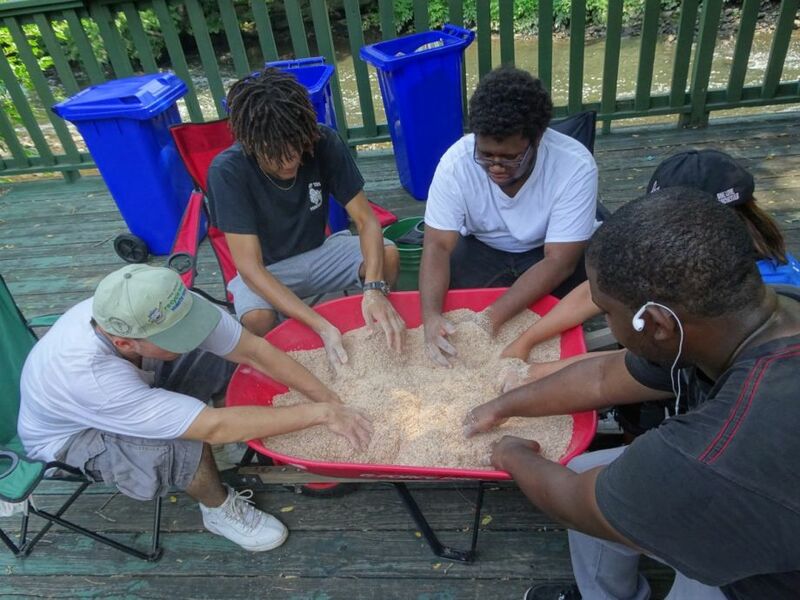 This summer, GreenFeen had five NYC Summer Youth Employment Program participants at their pilot composting site, at Drew Gardens in the Bronx. They wrote their own rhymes too, reinforcing what they learned about composting and sustainability. GreenFeen is starting small, and where they are today is largely due to their recent completion of the Green Worker Cooperatives’ Co-op Academy, also located in the Bronx. The academy is an intensive five-month training and support program for worker-cooperatives in formation. Funding comes from NYC taxpayer dollars, through the Worker Cooperative Business Development Initiative, along with a small amount of foundation support. There are some similarities to what conventional business owners might experience in a business incubator or accelerator program. The cohort meets at least once a week. Each cooperative also sets up a weekly time to meet with Omar Freilla, the primary instructor and founder of Green Worker Cooperatives (who also lives in the same neighborhood as St. Hillaire). Between sessions, each cohort has assignments: interview target customers; meet with potential business partners; refine the business model. Unlike the conventional business world, each group has to have at least two members in attendance at every session; it’s about forming a shared vision for each business, never one person at a time. Larger groups, like GreenFeen’s six member-owners, don’t have to send every member every week, but at least two from the group have to be there, no excuses. Once they get past a few introductory weeks, groups present their business model to everyone on a weekly basis, sharing updates and workshopping each other’s approaches. This most recent cohort, which included GreenFeen, was the Co-op Academy’s largest cohort yet. Twenty-five groups applied, and 11 were accepted. Six made it to the graduation ceremony —about the standard dropout rate, according to Sanjana Khan, of Green Worker Cooperatives. It’s partly by design — weeding out those who may not be ready yet or realize they don’t have the kind of time to commit to being part of a collective effort to start a business. Green Worker Cooperatives doesn’t want anyone to look back and regret taking on personal debt for startup capital or quitting a day job before really knowing what it would take to do this. “The ones that did graduate this time were some of the strongest we’ve been able to work with,” says Khan, who also works with each cooperative for a year or two after the graduation, providing additional support until they are truly able to operate on their own. Other graduates in GreenFeen’s cohort include New Deal Construction, which has already secured two contracts as a certified minority/women-owned business (MWBE). And Friends of Light, a weaving, design and production collective that went with Green Worker Cooperatives on a trip to Marseilles, France, to help promote worker justice in the garment and fashion industries. And Third Eye Studios, an MWBE photography cooperative that has plans to become the exclusive portrait photographer for public grade schools and day care providers in the Bronx, with a few schools already in its portfolio. GreenFeen is actually a bit behind others co-ops in their cohort, but with good reason. Their industry is facing some massive changes, and it may factor in to their next logical step. The lucrative waste collection industry in NYC is fraught with bureaucracy and entrenched interests, but is facing pressure to change. The city has been considering the adoption of commercial waste franchise zones, common in other cities but vehemently opposed by NYC’s existing commercial waste collection companies. Currently NYC has an open-market commercial waste collection system. Each business contracts with a city-licensed commercial waste collection provider, or “hauler,” of their choice. The city’s Business Integrity Commission (BIC) is charged with licensing, conducting background checks and regulating prices to ensure organized crime is no longer involved and haulers don’t overcharge. Open-market system proponents say it promotes competition based on price and best fit for each establishment. The reality is that the market is concentrated anyway, with the 10 largest haulers capturing 63 percent of the market, according to a joint studyissued last year by the NYC Department of Sanitation and BIC. That same study recommended the city shift to a commercial waste collection zone system, in which the city would carve out waste collection zones and award exclusive hauling contracts for each zone. It’s not uncommon in other cities, especially on the West Coast. The joint study determined that zoned collection could reduce truck traffic associated with commercial waste collection by 49 percent to 68 percent and reduce greenhouse gas emissions by 42 percent to 64 percent. Such a reduction could lead to improved health for communities near waste transfer stations — which are disproportionally located in low-income communities of color, such as the South Bronx. As the city contemplates shifting to a zoned collection system, GreenFeen sees opportunities as well as pitfalls. Some of those contracts could end up going to certified MWBEs, like GreenFeen. The city may also put some strong recycling or composting requirements on the contracts, favoring newer firms like GreenFeen that are more oriented in that direction. Or the contracts might get caught up in politics and be awarded to companies that donate the most money to politicians or can offer the lowest possible price even if that means less waste diverted into recycling or composting. “All these different things are things that could go to our benefit or to our detriment,” St. Hillaire says. For now, GreenFeen is testing out the composting component of its business model under BIC’s Community Composting pilot program. Under the pilot, if you are a nonprofit or an unincorporated group with written proof of access to a composting space, you may charge fees for collecting organic waste from commercial establishments for the purpose of composting. Under this arrangement, as an unincorporated group, GreenFeen will soon begin collecting food waste from Bronx Beer Hall. The way the commercial waste collection zones work out, it may make sense to just provide composting services to haulers. But, eventually, they’d like to provide hauling services to their neighborhood. They also see opportunities coming from the fact that they’ll be based locally and they plan to put a friendly face on a service that’s not typically known for its friendliness, or its transparency. * Perry Abello, Oscar. “Bronx Worker Cooperative Plans to ‘Compost Capitalism.’” Next City, Next City, 9 Aug. 2017, nextcity.org/daily/entry/bronx-worker-cooperative-compost-sustainability.